We’ve been very busy at the workshop as we’re getting ready to go to Norway! Mathew will be presenting at the Prøverommet (April 25th - 28th), a costuming conference aimed to bring the best of the best together and to learn from each other. Mathew will be there presenting his lecture “The Power of Proportion” focusing on the Bara measurement system and how to use it for your costuming. You can find his class and more on proverommet.com. If you want to see us grow and develop more content, follow us on our Patreon page! We offer great perks such as tutorials and videos. You can also become a patreon subscriber in order to support us and all the wonderful things we do. Its been far too long since I’ve posted here, but now is the time to get back to it. I began a new job last summer than took a long time to get used to and eventually, I realized that it wasn’t for me. I’ve left that position and now I have a bit more time to focus on the things that matter to me here at The Modern Maker. If you follow the link below, you’ll get the low-down on the next series of videos I’ll be shooting and delivering for the next several months. We will be making a lovely set of clothing for a woman. Two petticoats, a hip roll, stays, an over skirt and a jacket. That’s 6 pieces of clothing to make up the outfit. Now, I’m a clothier, I don’t make the accessories, but I will be looking for, and hopefully including accessories and where to buy them, or, if I’m lucky, I know people who MAKE them and you can hire them to do it. There are many options to finish the perfect townswoman look. I will show you only one example. Follow this link to subscribe to our videos, updates, mini-lessons! Masterclass weeks have begun! Our first week was breeches and those of you who follow us on FaceBook know that it was a success! Students created some fantastic pieces and I have made the poofiest breeches in my wardrobe to date. Next week will be nothing but pattern making. We will use the Bara System to prepare drafts, I will teach drafting principles and concepts and even show a couple of patterns for modern clothing. It will be enlightening. On a different note, The Modern Maker Vol. 3: Knitted Accessories, is well underway. I am starting to send out packages to my sample makers and pattern testers. I’m also doing a lot of knitting, but I can’t do it all, that’s why designers hire help! As of this moment, the book will have over a dozen patterns total. There will be 5 patterns for stockings of various weights and fibers (both top-down and bottom-up for the wool version), as well as 5 different hats, two pairs of gloves, and the finest gauge silk stocking pattern I’ve ever written and POSSIBLY a pattern for a silk/metallic jacket. I look forward to putting it all together! Once the whole book is written and editing begins, I will post a pre-order button in the store here on my site. I had projected a November release, but at this point, with all that has been added to it, the release will likely be early 2019. I’ll have more specifics once my sample knitters send me their timelines. I can’t expect everyone to knit as fast as I do. As a business, its hard to call The Modern Maker “successful.” I have struggled over the years to make it grow and earn. The issues surrounding this are many, but I think there is a bright future for our brand. 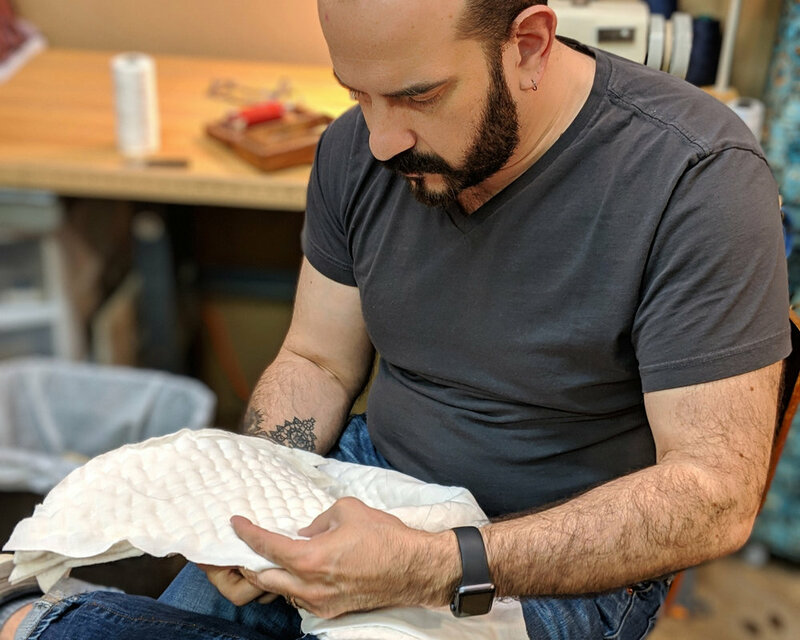 The Modern Maker masterclasses are not particularly well attended, but the students that do come and learn from me leave here with a very strong sense of accomplishment and excitement about what they are capable of creating with their hands. I’d like to spend more time teaching. I think the passing of this kind of knowledge should be done in person. I love making the videos and they have a strong place in the business structure now, but the quality of those lessons pales in comparison to what can be learned with face-to-face education and training. Because it has been difficult to make this business earn a revenue that is capable of supporting me, I have to keep taking jobs and that takes away from the time I can spend creating content for my customers/followers. Moving into the sphere of writing books and teaching classes was never meant to be a hobby or a side-job — It was meant to be my profession. I’m working hard to create enough product that revenue streams will grow and support the business, right now though, things are slow and difficult. The uncertainty in our economy has slowed down everyone’s desire to spend money on things that aren’t essential. Unfortunately, that means less growth in The Modern Maker. I’m pushing to do more, find new footing and create new product, but I’m also human, I have limits. The biggest help you, as the consumer, can be is to make sure you tell people where you learned what you know. I have seen many posts from many people, for years now, which show clearly that my work is being used, but not credited. I’ve noticed that people are quick to credit other authors and academics whose work is used in their projects, but for some reason, my name gets left out of bibliographies and sources. Its frustrating and disheartening as I’m constantly working at full-tilt to bring people closer to history and when I’m not credited, my business loses out on the brand recognition it needs to grow. I don’t understand it, but each of you can help by making sure you encourage people to work with The Modern Maker. In order to create products that will sell more frequently, it has been discussed that I might branch out into modern clothing patterns that use the proportionate system to generate patterns. In doing so, I will be taking a half-step away from history and into a market that is more likely generate revenue. Using the Bara system in this manner would enable every shape of person to have quality modern clothing that fits well, is custom made and is unique to them and can be made of fabric suited to their individual tastes. This will start very slowly as I already have too many irons in the fire at the moment, but it will happen. Not only will I be putting out patterns, but I can also make videos to show the processes for making them. I will use a machine for most pieces but at least one of the collections will be designed for hand sewing techniques. I've talked a bit about this on my Facebook page (just look up The Modern Maker there, you'll find me). I am exploring the idea of unity of my work right now. Because my creativity is so diverse, I have spent a great deal of energy dividing my focus so that each of my creative paths was separate from the rest, for the most part. Now though, I'm finding it very difficult to keep up with all the posting and various pages that I have to manage because of that choice. This separation has evolved organically over the past decade, but now it seems like they should start coming together. I have focused on the concept of "voice" in my work and I'm finding that I can't express myself fully as an artist while trying to keep everything separate. This Website is well designed to keep everything in one place, but organized. That won't change. What will begin to happen is that you'll see more posts on this blog about the various creative pursuits that I follow. From fine art to sculpture, to fashion to personal growth through creating. I hope you enjoy the shift, and I hope it inspires you to speak and create with your whole being instead of keeping everything separate. ART IS IN YOU, OBJECTS ARE ITS EXPRESSION, NO MATTER WHAT THEY ARE. I'm so excited that there has been so much interest in more masterclasses at my studio. I have scheduled a series of classes throughout the month of October. Drafting, Stays, Doublets and Kirtles are the classes that will be taught this year. Please visit the Workshop Registration page to purchase your seat. There is always interest, but often, its difficult for people to take a week off of work, so I'm in the process of developing some 3 day (fri-sun) Workshops in my studio that will be faster, less expensive and very informative. It is likely that they will all be very technique focused rather than garment focused. Too much work goes into a single garment to make it feasible to teach the construction in 3 days...but learning a technique or two and honing that over the course of 3 days is most certainly possible. One of the more important things is that all the seats are filled. There are only six seats available per week and my hope is that they will sell fast. If they do, I will plan another set of classes so that I am teaching a round of classes every three months or so. Those of you who follow my work on Facebook know that I am always busy. I don't spend much time idle or sedentary. Three years of working on The Modern Maker Vol. 2: Pattern Manual 1580-1640 have taken a toll on my creativity and passion for these clothes and the joy of making them. Each piece that I have made for the purposes of the book has been a technical journey rather than a creative one and that has left me somewhat bored with the 17th century as a whole. I am choosing to focus on the details now rather than the garment shapes as a whole. In those details are dozens of skills that I have yet to master: bobbin lace, needle lace, embroidery, and braiding trim, to name a few. The Summer months are usually a time when I get back to detail work anyway (since many of those skills are small and transportable), so my need to go deeper with technique and study is in sync with my natural rhythms of interest. The past two weeks have been spent teaching masterclasses in my studio in NYC. Teaching people about the finer points of hand-tailoring a doublet or drafting patterns using the Bara System has been invigorating. This year, Doublet week was among my favorite sessions. I was inspired, my student was inspired and we both made great pieces. I have three jobs over the next couple of weeks. The first, is to continue the doublet construction series of videos for my Subscribers. The second is to make a suit for a new client....and make it really fast. More to come on both of those. The third is to find a way to reignite my passion and fan the flames back to full strength.